What it’s about: A woman on “rest-cure” at a new house for the summer is confined to the upstairs room with queer yellow wallpaper, which seems to change and rub off on her when she brushes against it. She believes that the room used to be a nursery, and the children hated the wallpaper as much as she does. As she descends further into psychosis, she beings to believe that there is a woman trapped behind the wallpaper, creeping around on all fours as she tries to escape. Why it will keep you up at night: There are several interpretations of the end of this story that leave my skin crawling. One suggests that the narrator has hung herself in the room: “I am securely fastened now by my well-hidden rope,” and the physical descriptions of her “creeping” over her fainted husband are really her body swinging back and forth above him. Whether or not this interpretation is true, her madness as she begins to believe that she is the woman trapped behind the wallpaper is visceral from the first-person perspective, and the images are terribly unsettling. 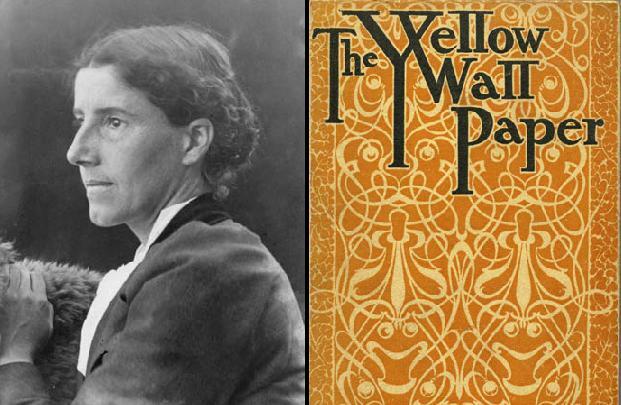 Read The Yellow Wallpaper now! I found this story on the internet. It is very creepy reading about her descent into insanity. I agree with your interpretation of the ending. Another truely creepy read. Thanks. I am currently reading H.P. Lovecraft stories and am into blood curdling tales thanks to you!